The Ketoslim slimming pack is a complete program that will help you burn fat, drain tissue and lose weight. It contains a high concentration of raspberry ketones. 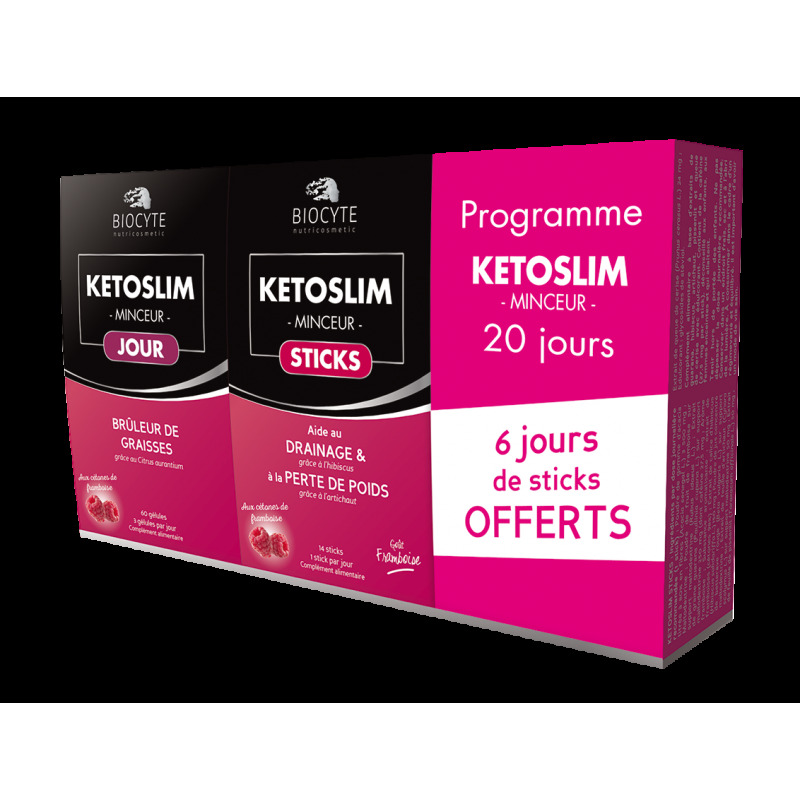 The combination of two Kétoslim® food supplements (capsules and sticks) is ideal for individuals who are looking for a weight loss aid in order to lose a few pounds while on a diet. The combination of specific active ingredients will help the body break down fat, with a dual fat burning and draining effect. Take 3 capsules of Ketoslim capsules with a large glass of water in the morning during breakfast. 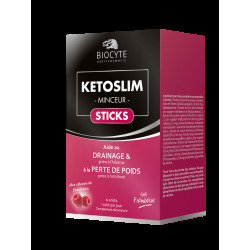 Then dilute a Ketoslim sticks® stick before lunch in a glass of water (200 ml). Drink in one morning in the morning. Sticks with delicious raspberry flavor. - Individuals looking for a weight loss aid to help control weight, eliminate fat and lose a few pounds while on a diet. Capsules: Dietary supplement based on raspberry ketones and extracts of Citrus aurantium and wakame. Sticks: Food supplement based on Hibiscus, Dandelion, Guarana, Artichoke and Cherry Tails, with sweetener. Keep out of reach of children. Not recommended for children, pregnant or nursing women and in case of antihypertensive treatment. Do not exceed the recommended daily dose. Store in a cool, dry and well ventilated area. To consume as part of a varied and balanced diet. It is important to maintain a healthy lifestyle.